It is only with the full relational form that the ethos of action learning has to pervade the enterprise as a whole. Up to that point, the assumption the enterprise makes is that it can rely upon Faustian pacts with individuals operating at its edges to deal with demands that go beyond the complexity of its own business models. An enterprise differentiates its behaviors in relation to its environment to create value, while at the same time trying to sustain its identity through retaining some form of competitive advantage. How successful it is depends on the kinds of competitive asymmetry it can sustain, which in turn depends on its ability to integrate differentiated behaviors. The strategy ceiling is a way of thinking about how an enterprise does this. The strategy ceiling is that level above which it is “none of your business” how an enterprise competes – the assumptions above the strategy ceiling are the tacit taken-for-granted basis on which the enterprise determines its behavior built into the way the enterprise operates at ‘design-time’. 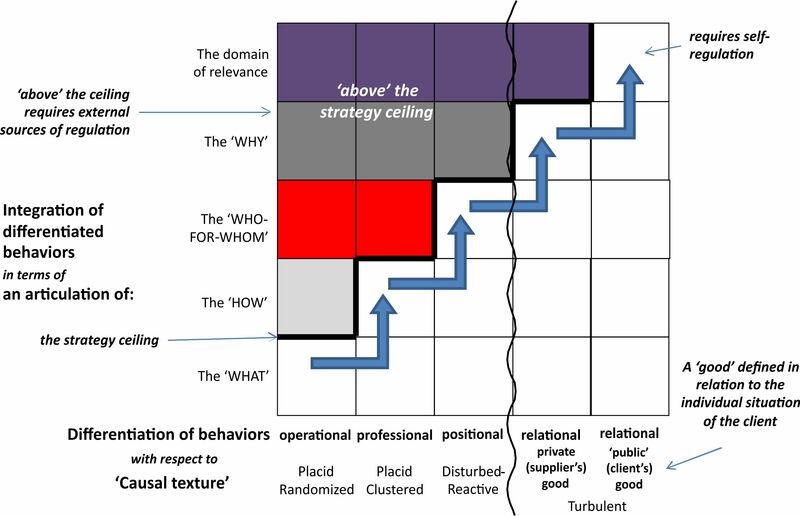 Thus the four forms of ‘causal texture‘ described by Emery and Trist (1965) demand a progressive differentiation of layers of behavior for which there needs to be a corresponding progressive articulation of ‘run-time’ assumptions about how to differentiate behaviors, and therefore a progressive lifting of the strategy ceiling imposed at ‘design-time’. Tacit assumptions have to be made explicit and dynamically responsive to demands differentiated at ‘run-time’. operational integration – how, for whom and why things are done as they are remain unquestioned. It is sufficient to focus is on operating the business model as it is. professional integration – bodies of know-how have to be developed for how things are done in order to scale efficiencies, but the customer is still defined by these ways of doing things. positional integration – different types of demand from customers are defined by the different market positions through which the enterprise chooses to compete based on assumptions it makes about the WHY of competitive advantage. The WHAT, the HOW and the WHO-for-WHOM of the enterprise model are varied dynamically to achieve maximum competitive advantage in those chosen markets. relational integration – all aspects of the way enterprise competes are capable of being aligned to particular demands, including the way the enterprise competes. This form of integration is distinguished from positional by the ‘squiggly line’ because to be effective, the enterprise has to move from a N-S dominant approach to one that is E-W dominant. Considering just the middle three columns, a specific version of these strategy ceilings is described in Meeting the Challenge of Health Care Reform. The progression is from a professional (treatment-centric) through a positional (episode-of-care-centric) to a relational (through-the-life-of-the-condition-care-centric) approach, the changes in the way differentiated behaviors are integrated being expressed in terms of architectures. ‘Design-time’ is distinguished from ‘run-time’, the latter being the time of the dynamic operational interactions of the enterprise with its environment. Where there is a strategy ceiling there is an a priori constraint placed on the way the enterprise competes imposed at ‘design-time’ constituting the strategy of the enterprise as a whole. This is taken up latter in tempo, entanglement and east-west dominance. These strata emerge as a way of understanding the relationship of an enterprise to its edges – see finding the edge. They are further elaborated in the series of postings linked to by ‘So you say you want to put your clients first…’. ‘messiah’ leadership responding to the ‘positional’ cultures that emerge from sustaining the competitive advantage of business models with respect to their market positioning, the point being that to transform and realign these cultures to new definitions of ‘market’ is ultimately a center-driven choice. Of course the only reason for an enterprise to increase the differentiation of its behavior is on order to maintain congruence with its environment. Thus while Simon approaches the discourses in terms of their progressive emergence in society, the above relates them to the particular way identities are invested in the enterprise .